Dhambalin, a sandstone rock shelter, was discovered in autumn 2007. Theunique site holds polychrome paintings including the first sheep paintings in Somaliarchaeology. There is an extraordinary originality in the paintings, particularly thoseof the sheep and goats. There are unusual quality images and styles of humplesscows of which some are headless. 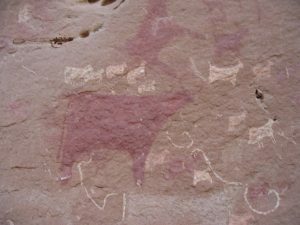 The fauna depicted include antelopes, dogs,giraffes, snakes and a turtle, some of which are associated with human figureswearing what appear to be headgears and holding bow and arrows in hunting scenes.Relative dating is possible perhaps through the superimposition of various styles of paintings. Also the site shares some similarities with the Neolithic or protohistoricArabian–Ethiopian Style in the Horn of Africa. Hence, there is a need for amultidisciplinary approach to the ritual landscapes, religion and identity in the Hornof Africa. With its richness of fauna, including unambiguous depictions of sheep andvarious styles of depiction of bovine, the new site of Dhambalin will no doubt play amajor role in shedding light on pastoral cultures and pre-historic symbolism in therock art of the Horn of Africa. Sheep and goats at Dhambalin, 2008. ACCESS Mire S. (2008), The Discovery of Dhambalin Rock Art Site, Somaliland, African Archaeological Review 25(3-4): 153-168. Related publication OPEN ACCESS Mire S. (2015), Mapping the Archaeology of Somaliland: Religion, Art, Script, Time, Urbanism, Trade and Empire, African Archaeological Review 32(1): 111-136.